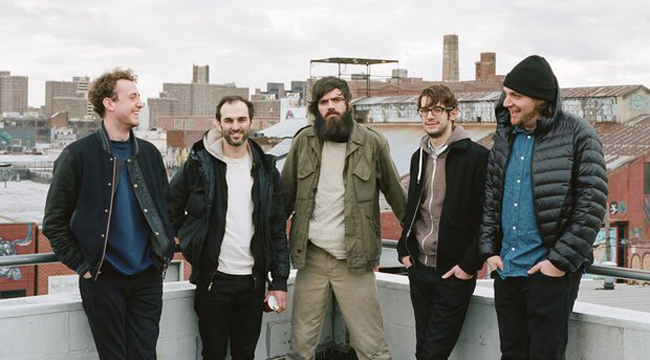 Paired together on the “No Faith / No Future / No Problem” tour, indie rockers Titus Andronicus and singer-songwriter Craig Finn will undoubtedly make for good tourmates. The two have a long history and they’ve even teamed up for a free download, a digital split single of mutual covers that shows off their love of writing songs with the title “No Future.” Titus singer Patrick Stickles recently phoned us from his home, where he was trying to cross the “T”s and dot the “I”s and “get everything ready for the big trip.” He talked about the co-headlining tour and the band’s most recent album, last year’s ambitious The Most Lamentable Tragedy, a concept album about manic depression. What inspired the tour with Craig Finn? Craig’s been a good friend to the organization for many years. We first met in 2009 and played at this small festival together in England. We were hanging out outside the club and he came over and introduced himself and said how much he liked our first album, which had just come out. From the beginning, he’s just been a warm and gregarious guy. We were neighbors for a few years and hung out a lot. He has been generous with me in sharing his wisdom and knowledge as a slightly more seasoned veteran of the game. Whenever I have career questions about how to sustain life as a rocker, he’s been open and helpful about that stuff. We played with the Hold Steady a couple times but have never done a big tour. We’ve been looking forward to a more extended collaboration like we’ll be doing on this tour. Do you think your fan-bases are similar? I think so. I know our fans like him and like the Hold Steady. We often see a few Hold Steady T-shirts at the Titus Andronicus shows. I think there’s a good deal of overlap. He appeared on stage with us at our CD release show this past summer as a surprise guest. We did a Hold Steady song and a very sizable and enthusiastic vocal chunk of the audience was very familiar with it and were singing all the words. I think it bodes well. Talk about what inspired the new album, The Most Lamentable Tragedy. I’m curious as to how you first came up with the concept and how long it took you to put all those songs together. It took a very long time. The concept first came to me in 2012. I was having a hard time in my personal life. I was struggling with my mental health. I was depressed and not feeling a great deal of hope for the future. Every record you make is a snapshot of where you’re at when you make it. The themes are the themes of your life at the time it’s being constructed. When I was going through this dark period I said that I didn’t feel enthusiasm to make another record but if ever I did than surely this would be the subject of that record because it was such a highly engrossing and formative experience in my life. It seemed natural that the rock opera format would be the most appropriate way to express all the stuff that I wanted to do. From that point, it took about a year to realize it would be a rock opera about the manic depressive experience. It took about another year or so to write the songs and to learn them with the band and figure all that stuff. It was most of another year recording it. It was a very big process. At times, arduous. It was a lot to do. Are you a fan of classic rock operas? Well, not in so much that all my favorite records are rock operas. I don’t listen to them exclusively by any means. I think that any kind of piece of art whether it’s a rock opera or not or a book or a play or a painting, they are all just vessels and mediums. What’s really important is the thing you’re trying to get across. Even if I don’t only listen to rock opera, there have been some that I have liked very much — Separation Sunday by the Hold Steady comes to mind — all the best records have a certain thematic unity. Even if they don’t have a linear narrative or characters or any of this stuff, there’s a common thread in the themes that bind them together. When you appreciate it and look at it as a cohesive collection of songs, you get a richer experience out of listening to it. What made you want to cover the Daniel Johnston tune “I Lost My Mind”? One of the reasons that I thought it was okay was because we set out to make a double LP. It ended up as more of a triple LP but the original double LP schematic, I thought it would be okay to include two cover songs because my personal favorite double LP is Exile on Main Street by the Rolling Stones, which is something I was listening to a lot during the process. It has two cover songs on it. If the Stones say it’s okay, then why should it be any different for Titus Andronicus? Daniel Johnston has been an important inspiration to me. He’s a hero to many manic depressives, particularly artistic types, and I thought his story and the stuff he talks about was right in line with the kind of things I wanted to talk about. It felt like a natural thing and it’s a tribute to him too because of how much he’s inspired and validated me and how much his story has enhanced my own understanding of myself and my life. I would humbly hope the work we’re doing now with this rock opera could do some version of that for some kid who’s as lost and confused as I was during my life. I think you’re working on a film based on the album. What’s the status of that project? That had been a dream of mine early on in the conceptualizing stages. It took quite a bit just to make the 15-minute film. A lot went into doing that. We burned through most of our video assets budget on that project. That was for the first act and it would have been cool to do videos for the other four acts. We’re a rock band anyway so we have direct our energy to that. If we never had to get on stage, then sure, why not sit around and make a bunch of movies? We belong on the stage and not behind the camera. Do you play the new album in its entirety? No. We haven’t done that so far and I don’t anticipate that we will. The live concert is supposed to be a spontaneous, fun thing and the audience doesn’t know what’s going to happen. You want to take them on a ride and give them a thrill. When they know everything that’s coming that’s a little predictable and maybe anticlimactic. Furthermore, we have to this record isn’t necessarily everyone’s favorite. Everyone has their own favorites and they all have songs that they want to hear. We try to present a career-spanning set with enough hits that everybody feels like they got their money’s worth. We’re public servants that way. What originally made you want to start writing songs and form a band? I don’t know if there was any one particular moment. I got interested in music and rock ‘n’ roll and playing guitar when I was in my teens. I figured it would be more of a hobby or on-the-side to whatever my traditional life path was. When we made our first record we were just college kids and had an opportunity to record an album. We had support from Troubleman Unlimited, who threw us a little money to make a record. We had gone out on tours we had booked ourselves. We wanted to do as big a version of the rock band thing as we could but not with the intention to be rock stars. The first record we did got some good attention and it seemed like we could get more time out of it so we put our regularly growing up life on hold for a little while and here we are eight years later trying to milk it and see how long it can sustain itself for.